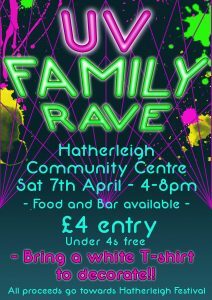 Hatherleigh Festival kick off this year with a brand new and exciting fundraising event for the town – a UV Family Rave! As the name suggests, the UV Rave will feature some fantastic UV lighting, so to get the party started, we will be holding a t-shirt decorating table which will be running all night – this is for party-goers to decorate their own white t-shirt from home with UV paints to really light the place up! The UV Rave is on Saturday 7th April at the Hatherleigh Community Centre from 4pm-8pm, and is open to children and families of all ages, with £4 entry and free entry for under 4s, including use of the t-shirt decorating table (just don’t forget to bring one!). Food and bar both available. All proceeds will go towards the Hatherleigh Festival.